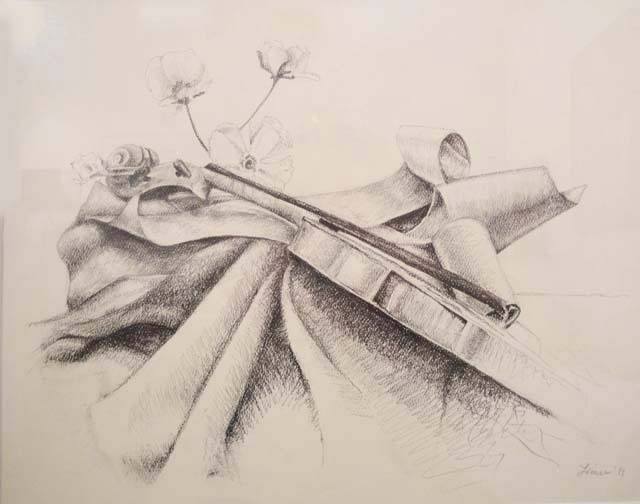 The Momento Mori or Vanitas still life I talked about in post for 6.17.11 led to a meticulous drawing by Louise F. I’ll show two stages of her drawing. Above is the drawing as it was at the end of the three-hour class. I liked it at this stage and considered it finished. I loved the side view of the violin because it was unusual and unconventional. It offers a hint of the violin and just enough information to allow the viewer to identify the object. There’s a mystery about it because of its averted angle. Also mysterious are the flowers—where do they come from? Then the scrolls of paper, echoing the scroll at the violin’s neck, but again, what are these things doing here? We can’t quite make sense of the meeting of these objects, but at the same time the forms are perfect, all playing on each other. Louise didn’t think it was finished at this stage. She didn’t like the vacant space at the bottom. 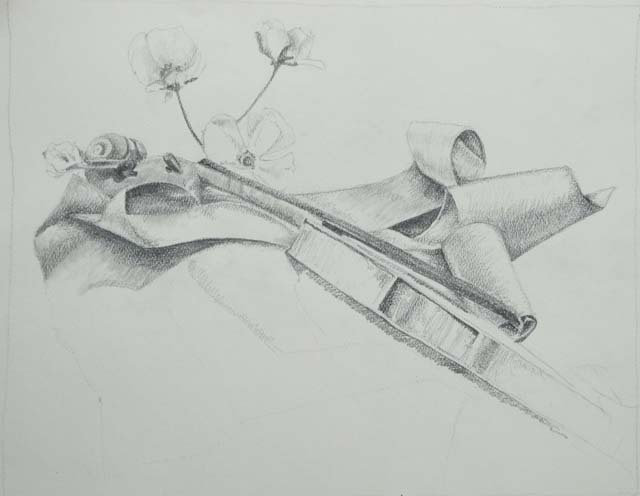 The violin was resting on some drapery, which she didn’t have time to draw during the class period. 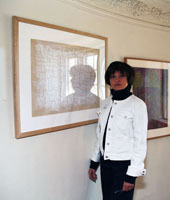 She invented some drapery at home, filled in the “vacant” space at the bottom and framed the drawing. The pencil marks now fill out a rectangle, which conforms to the shape of the mat and frame. There’s more to look at. The drawing looks more finished and complete and this is satisfying to most viewers. We’ve encountered the opposition of the classical and romantic sensibility before in this blog. My preference for the “vacant” space, for the incomplete feeling, is part of the romantic approach. Louise, like most students (in my experience), preferred the complete, balanced drawing without the open space. That’s the classical sensibility expressing itself.